205th St. bound D train approaching Bay 50th St. station. Resized photo courtesy of Eye On Transit. In our continuing effort to solicit feedback from our customers, MTA New York City Transit is again distributing Rider Report Cards throughout the system. 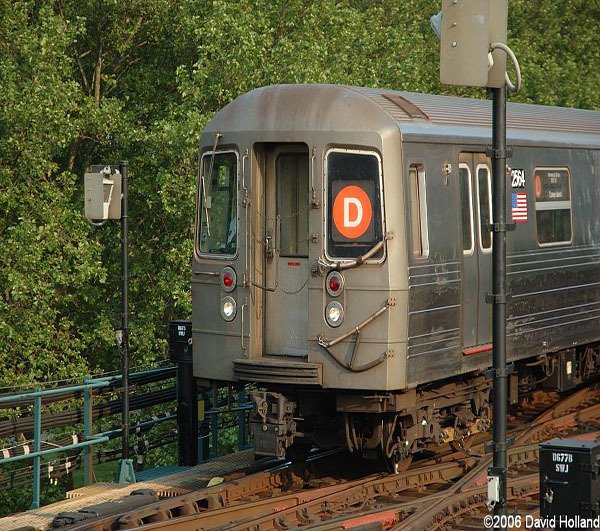 Riders on the D are next in line of NYC Transit’s over five million daily subway customers asked to rate the progress of their line since the initial round of report cards was distributed in July 2007. The report cards are being distributed to riders during the morning rush hours from Monday, November 3rd through Thursday, November 6th. The cards will be handed out at several different stations along the line each day over the four days. Grades will be used to identify rider preferences and to gauge how much improvement customers along the D line have noticed since last year’s report card. Again, the Rider Report Card will ask subway riders to grade 21 specific areas of service from an A (Excellent) to an F (Unsatisfactory). Among the areas riders will grade include: car and station cleanliness, safety, security, quality of announcements, and the courtesy and helpfulness of front line customer service staff. Riders will also assign an overall grade for D line service. From this list of 21 service attributes, riders are also going to be asked to rank the top three improvements they would like to see made to this line. •	Monday, November 3rd – Coney Island-Stillwell Avenue, Bay 50th Street, 25th Avenue, Grand Street, Broadway-Lafayette Street, West 4th Street-Washington Square, and 34th Street-Herald Square. •	Tuesday, November 4th – 47th-50th Streets/Rockefeller Center, 7th Avenue, and 59th Street-Columbus Circle. •	Wednesday, November 5th – 125th Street, 135th Street, 145th Street, 155th Street, 161st Street-Yankee Stadium, 167th Street, 170th Street, 174th-175th Streets, Tremont Avenue, and 182nd-183rd Streets. •	Thursday, November 6th – Fordham Road, Kingsbridge Road, Bedford Park Boulevard, and Norwood-205th Street. I wonder if the ridership is that low at many of the stations that they are not included in the list of locations for report card handouts. I feel they should hand them out at every station or at least have a display where a straphanger can pick one up when entering or leaving the station. Was there a stopage or halt to the Uptown 6 train service tonight in NY around 11pm or so? I heard that there was a police investigation somewhere down the track line and that hundreds of people were stranded inside the train for almost an hour. I think they said train was stopped around 86th st. Can anybody confirm? ?